Made in America Christmas: Are You In? 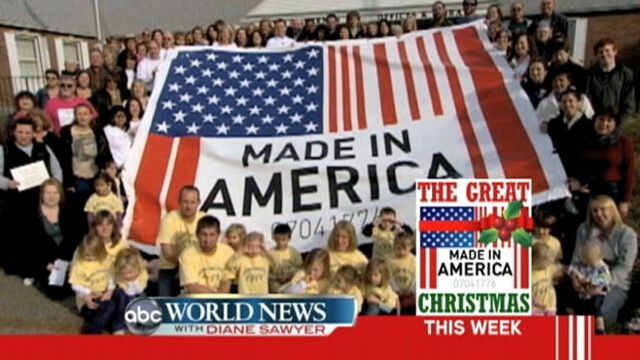 "World News with Diane Sawyer" is gearing up for a "Made in America Christmas" and we need your help. Now we want to know, are you in? If so, we want to hear from you. How are you planning on spending your $64? What great Made in America products have you bought or plan on buying? We want to hear how you are buying American this holiday season and how you are inspiring others in your community to do the same. Have you encouraged your family, friends, neighbors, book club or church group to spend $64 on Made in America products this holiday season? How many people have agreed to do it? Share your story with us and it could be featured on "World News with Diane Sawyer" or on ABCNews.com. And if you are looking to be inspired check out our constantly growing list of Made in America Christmas gift ideas!